I was all excited to visit this place in Connaught Place called Open House. Geared & charged up I went to the restobar which was done in red in the truest sense & blue in the coolest sense. Hip, hit & happening is the word for Priyank Sukhija’s places! It’s amazingly comfortable & vast with a DJ in house and is a warm & lively lit up place. Every corner of the restaurant is so nicely done. I met the F&B Executive Manish Joshi, the Sr. Captain Vikas Singh & the in-charge Rajat who greeted us very warmly & helped us decide our order. 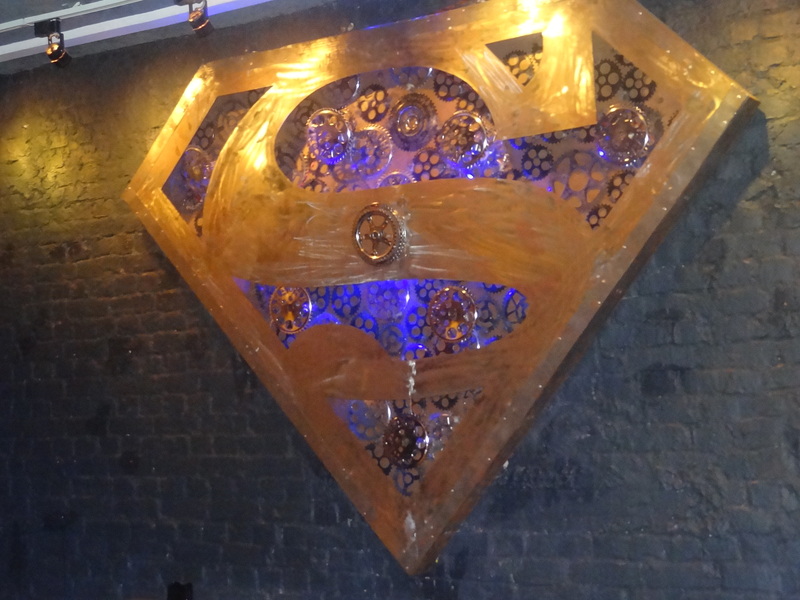 There is a scripture of an owl on the walls, Superhero characters, many bottles of drinks in the bar section with many interesting books on the shelf. The resto is huge with crowd always pouring in for more love for food & excitement say like what Priyank wants & desires. 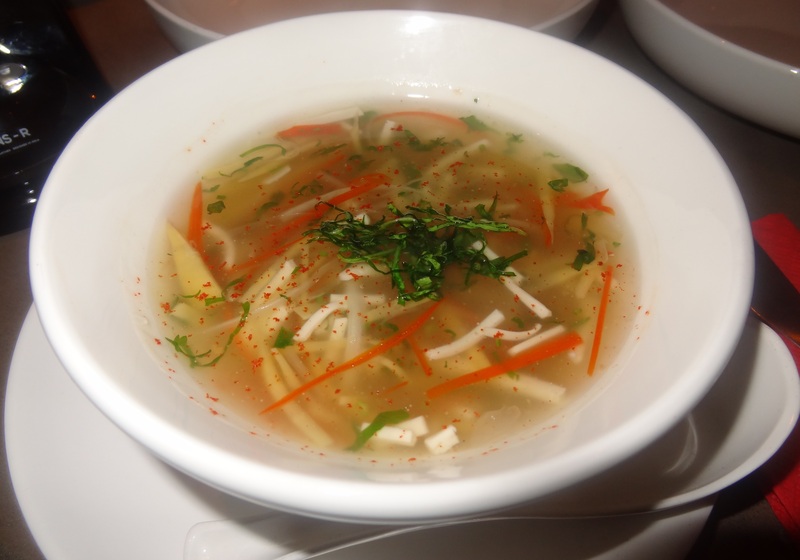 The second soup I tried at the table was Hot & Sour Chicken Soup which was lovely & spicy and made me drink the whole bowl coz it was superb. The spicy creamy soup was healthy & full of nourishment. 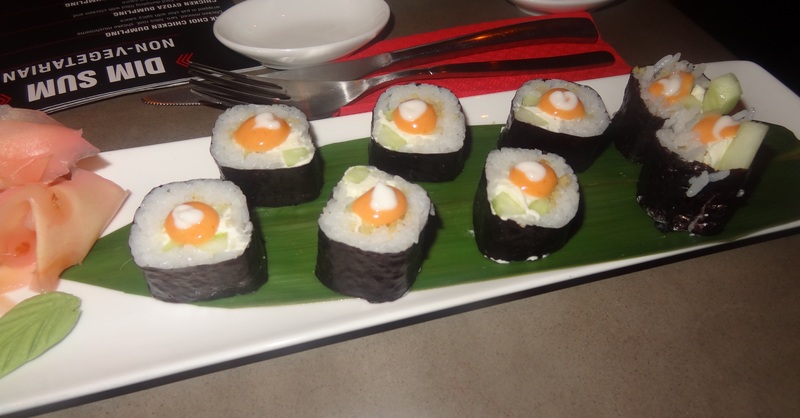 Next, we ordered for Tori sushi which had grilled chicken with lettuce in mayonnaise. It was awesome & I loved the taste of crispy carrot, asparagus, grilled chicken & rice. The ingredients were blended well & tasted nice. The other sushi Kappa Maki was a cucumber roll which had tenderly made rice & nourished outer coating combination of seaweed (A great & healthy option). It had a very innovative, cool & refreshing taste. Definitely one of the best sushis I had ever had! Soya sauce was also given as the dip. They even have a live counter for making these sushis. The Pak Choi Chicken dumpling had chicken minced, taro, lotus root, shitake mushrooms wrapped in pak choi with spicy sauce. The chicken was nicely minced. It was spicy, warm & hot to taste. Non-veg lovers who like hot & spicy food would love it. Then we ordered the Vegetarian Mock Duck Salad. It had Veg mock duck (basically soya chunks), romaine lettuce, iceberg, pomegranate & duck sauce. It was a bit sweet (the pomegranate made it sweet) but a very different taste altogether. It was crispy, healthy, juicy, sweet & nutritious. 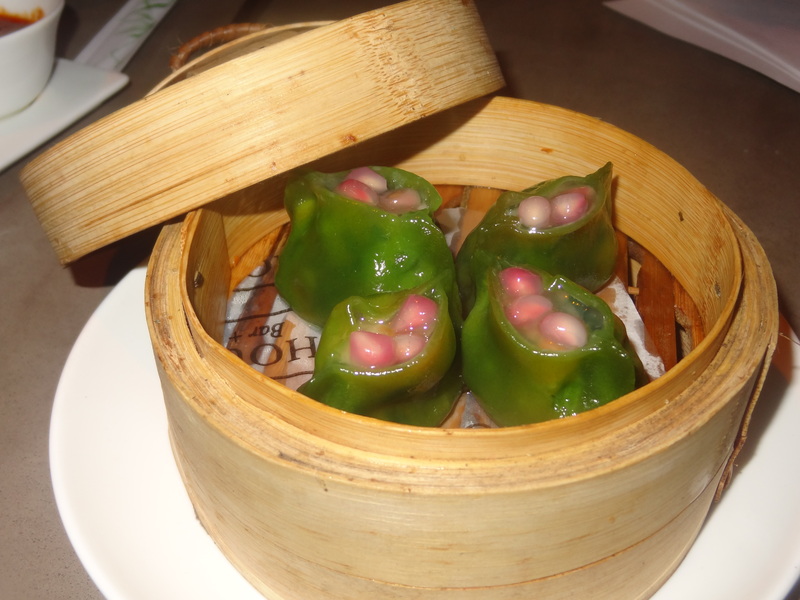 The Chive Veg dumpling was full of chive flower flavour & had carrots, celery, water chestnut topped with pomegranate seeds. 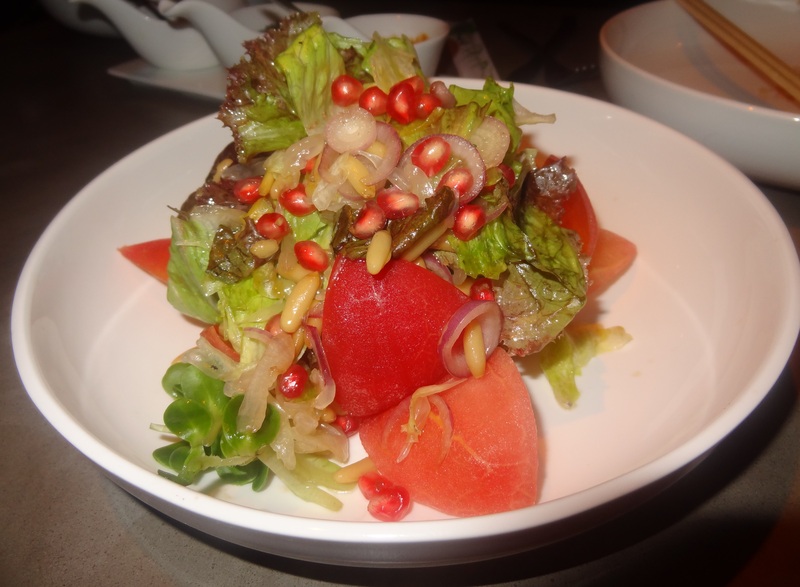 It was a lovely mix of healthy food & I felt refreshed as the pomegranate was mild & good to taste providing it the mix of all the crispiness and the right flavours. It was also blended well, prepared nicely & tasted perfect and it’s the most recommended item on my list. The Veg. 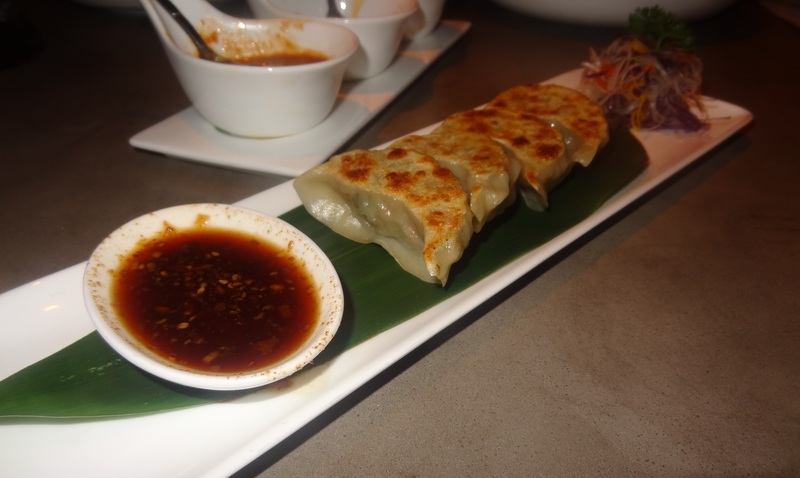 Gyoza Pan Fried Dumpling is a pan fried dumpling with lotus root, carrot, celery and water chestnut served with shanghai sauce. The dumpling was crunchy with lovely celery in it. The consistency was good with the filling tasting superb. The Lemongrass Tofu in Kaffir Lime, Pineapple & Galangal was really good and warm to taste. I loved eating the soft and mushy tofu pieces. I got immense pleasure because of the kaffir lime flavour in it. The after taste was spicy & left a good taste. 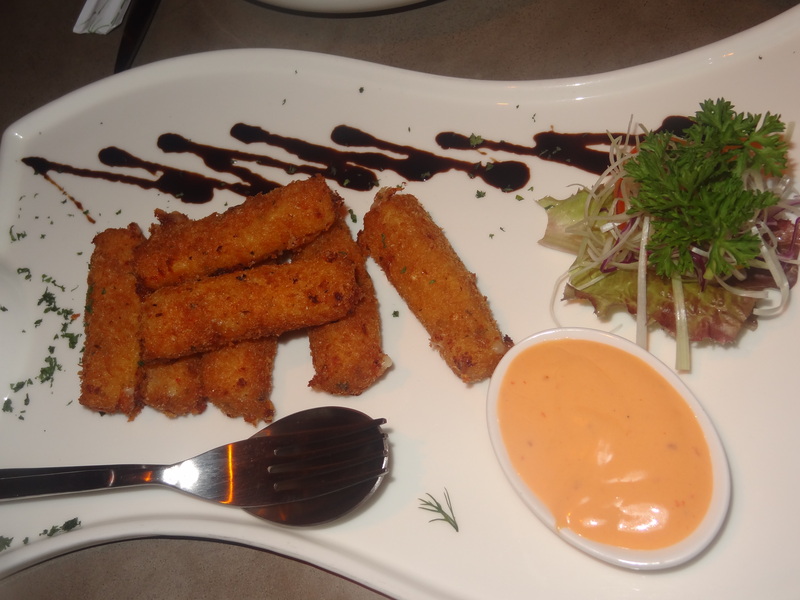 The Mozarella Cheese Fingers were soft, cheesy & delicious served with salad and a cheesy dip layered with soya to add to the taste & appeal. The after taste was cheesy & lovable. For the main course, we ordered the Peri Peri Chicken Pizza. 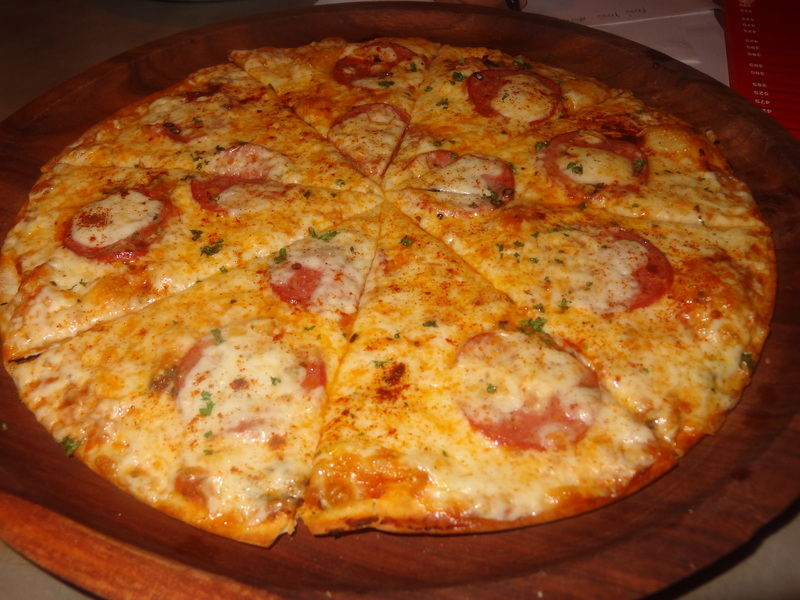 The pizza was quite generous with cheese & had a hot and spicy flavour in thin crust. It was actually real thin & crisp on the baseline. The peri peri chicken was cut like pepperoni and the peri peri made it all the more spicy and hot. A definite thumbs up for the spice lovers!!! The Veg Taro spicy schezwan fried rice were basically spicy rice with edamame & taro in Schezwan sauce. It was indeed very spicy made the foreign way (Thailand inspired) with taro (root vegetable). They were garnished with spring onions & lots of chopped chillies. 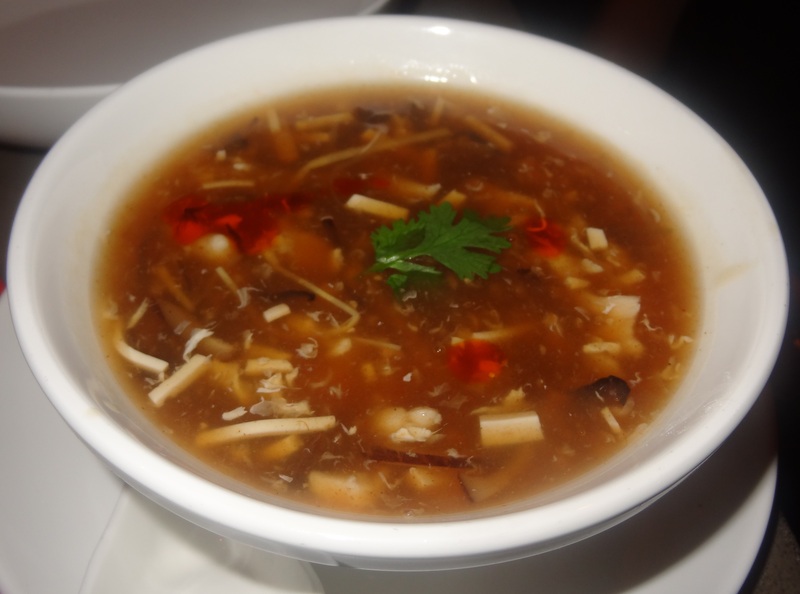 I loved eating & enjoying the Schezwan taste. 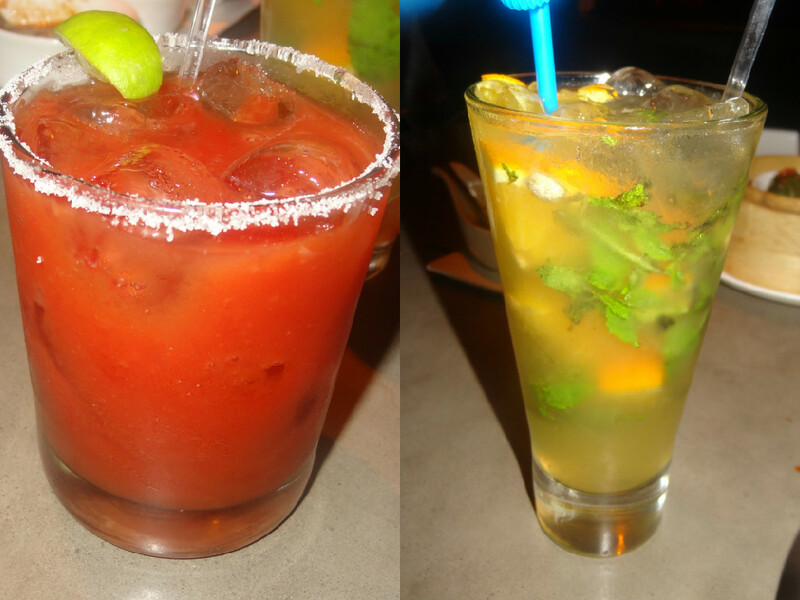 The mocktails I tried there was the Virgin Wasabi Mary made with tomato sauce, tobacco sauce, celery salt & lemon juice with lots & lots of ice. They have tried to give regular Virgin Mary a wasabi twist. The Wasabi sauce is spicy in taste since it’s of vegetable origin. 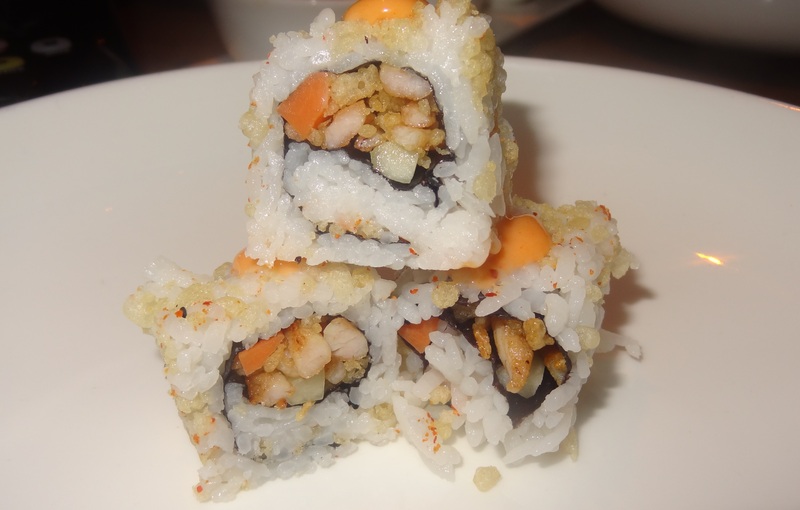 They also added spice herbs & thai leaves in it for the wasabi flavour to come out the way it did. Different, interesting & yes unique. The other mocktail I tried was the Orange juice with mint made with orange chunks, orange juice, lemon juice & a dose of sugar syrup for consistency. The juice tasted lovely with the orange chunks. Mint was also an essential part of the drink enhancing the flavour plus adding nutritional value. Coming to the desserts now, the Apple Wonton Tower was a mild dense spring roll sheet layered finely with lots of thick milk between. 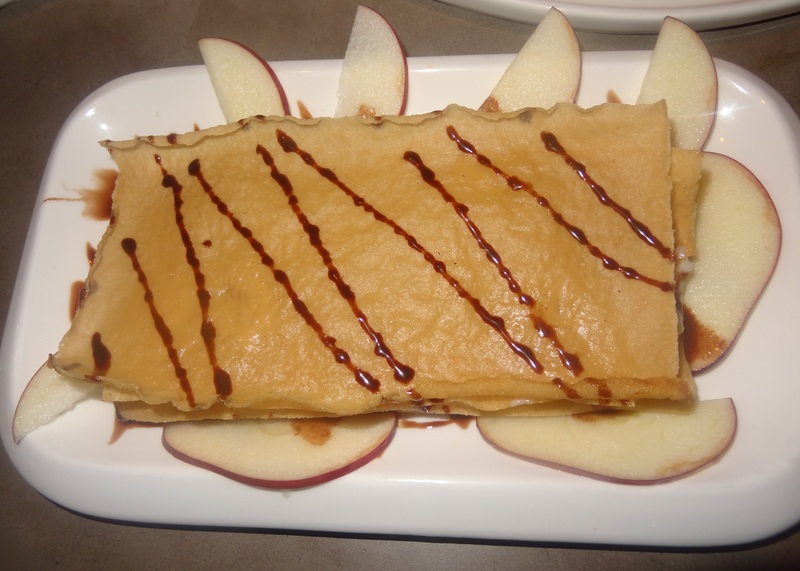 It also had finely sliced apples put in the layers for super excellent & fine dining taste. It was lovely & I had never had something so good & delicious. The milky flavour, the thin layers & the apples make the taste unforgettable. An excellent & super recommended dessert! It was also uniquely & nicely presented. 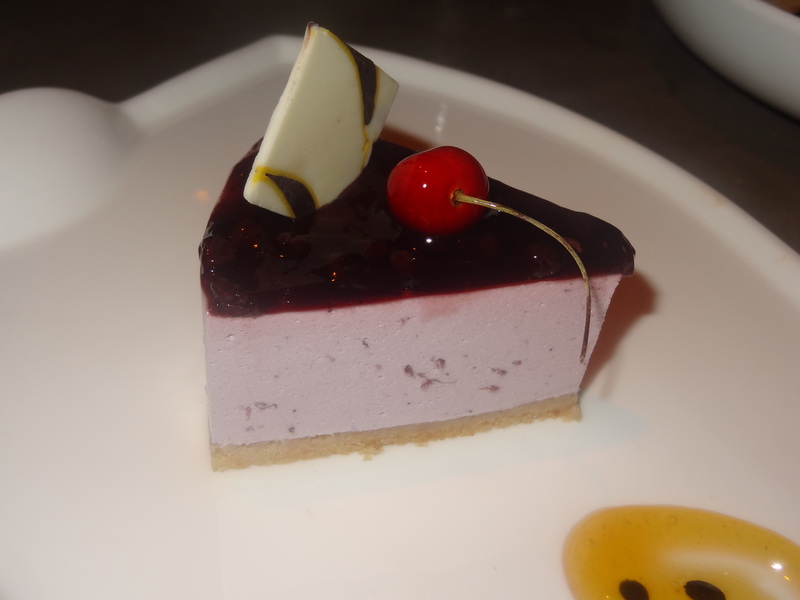 The Blueberry cheesecake was creamy, nice & excellently baked. A Good flavour but still apple wonton won the best dessert flavour award in ChicLifeByte’s dictionary. The restaurant opened on June 12th, 2015. They even have happy hours for people to enjoy the music, the ambience, the drinks, the food & their amazing 45 variety of dimsums. 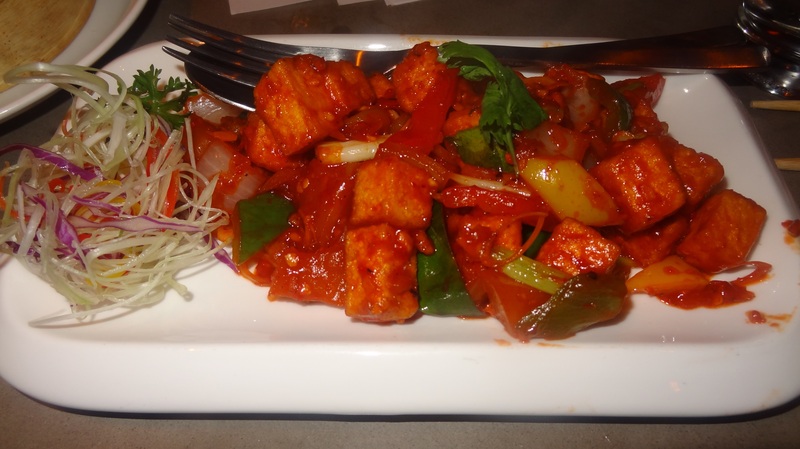 You will feel pleased with the excellent service of the Executive Chef Sunil Chauhan who is originally from Dehradun & says that they changed the menu on demand as the people who love spices he custom makes the dishes for them plus there is the green & nutritional dishes for the pure vegetarians too minus the spices with all the luck & harmony and peace. 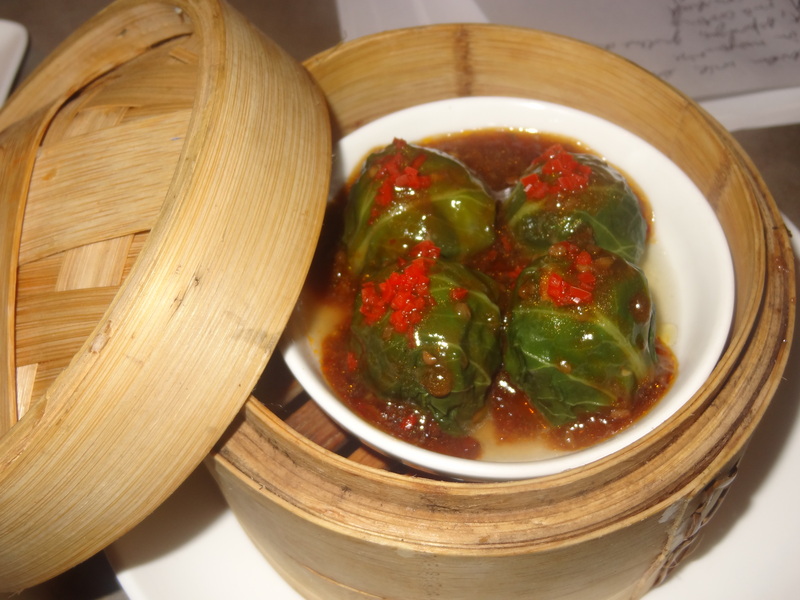 The chef’s favourite dish being Cheung Fun (steamed roll). In the centre of Delhi, it shines with its staff strength of 25 chefs & is sure to rock & hit the Indian resto pub scenario. Rock house food & a place to hang out & enjoy! 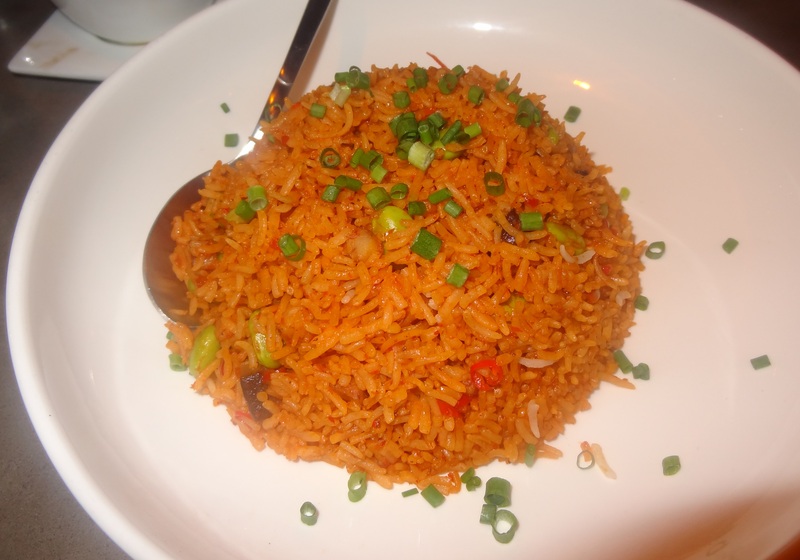 Those soups and fried rice looks yummy ! On my list now..will try it next time I’m in Delhi.